His electronic bracelet found in his apartment. 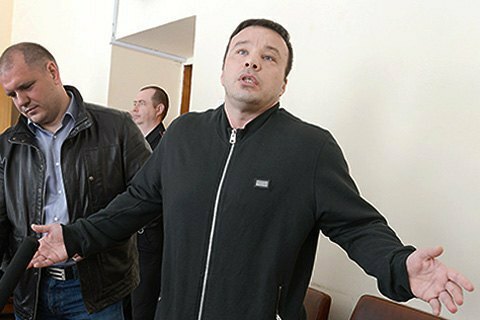 The organizer of the housing investment scam Elita-Center Oleksandr Shakhov (Volkonsky) escaped from house arrest. Volkonskiy did not show up for a regular meeting in the court. The electronic bracelet that he was supposed to wear was found in the appartment where Volkonsky has served his home arrest. The court put Volkonsky on the wanted list, the head of Kyiv's Podolsky district court told TSN. Volkonskiy has spent eight years in detention jail, but has never been sentenced. Under the so-called Savchenko law, on which every day spent in custody prior to sentencing is counted as two days in prison. Volkonsky was released from prison in the spring of 2016. Instead of 384m hryvnia bail, which he has not paid, the court put in the house arrest wearing an electronic bracelet. Volkonskiy was arrested in 2007 in Switzerland, extradited to Ukraine in October 2008, and jailed. He is charged of large scale fraud, under which he faces up to 15 years in prison. In 2009 he was recognized as the main accused and the organizer of the Elita-Center, a housing investment scam that has left 1760 investors without money and apartments.